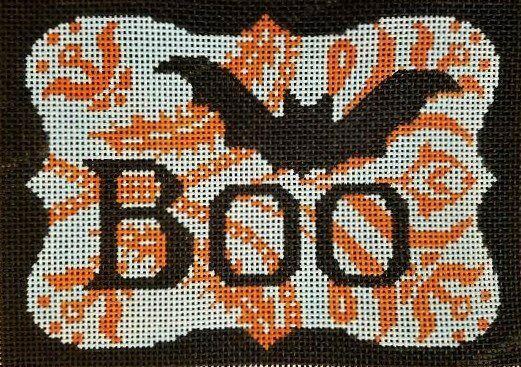 This Halloween Boo needlepoint design is handpainted onto 13 mesh Mono Zweigart needlepoint canvas and is easy to stitch. The design area measures 7.5" x 5". 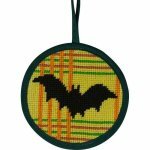 This Alice Peterson Halloween needlepoint design is sold canvas-only or with fibers. if you select cotton we will send DMC perle #3; if you select wool or silk we will send Planet Earth fibers. 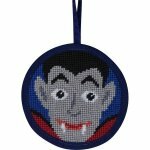 This halloween needlepoint Boo canvas usually ships within 7 days. If for some reason there is a delay we will let you know.